Note: You can enter this giveaway three (3) times per e-mail address per day. Deadline is 11:59PM ET 8.29.18. 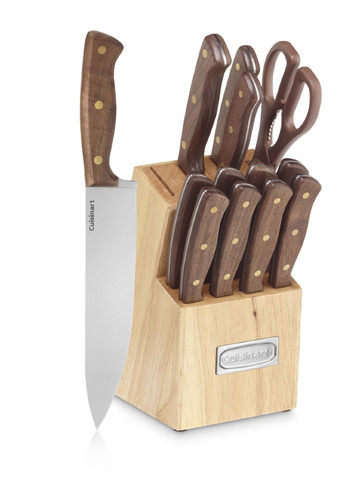 Not only does the Cuisinart Advantage Walnut Knife Block Set look sharp but each blade is sharpened to a fine edge to slice your Homemade Corned Beef expertly. All blades are crafted from high-carbon stainless steel for extra sharpness and accuracy and feature precision-tapered blades. The set includes an 8-Inch Chef Knife; a 6-Inch Bread Knife; a 5-Inch Utility Knife; 3-Inch Paring Knife; 8 Steak Knives and Kitchen Shears. Each piece conveniently stores in the wooden block that is included. NO PURCHASE NECESSARY TO ENTER OR WIN. Void where prohibited by law. Open to legal residents of the 50 U.S., D.C. and Canada (excluding Quebec) who are at least eighteen years old at the time of entry and have internet access. Begins on 7.3.18 at 12:00:00 a.m. ET and ends on 8.29.18 at 11:59:59 p.m. ET. To enter the giveaway, submit your full name and email address on this form. Odds of winning this giveaway depend on the total number of eligible entries received. Only three (3) entries per email address per day. Sponsored by Leite’s Culinaria, Inc. For more information, visit our Official Rules. For a list of winners, check out our Very Happy Winners page. Be sure to add giveaways@leitesculinaria.com to ensure notification if you are the winner.